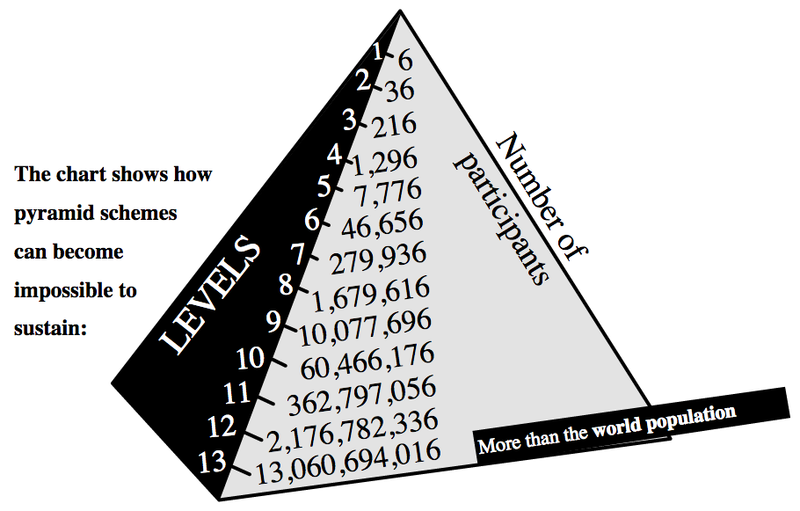 To explore an "equilibrium of an ecosystem in which players’ selfish behavior collapses the system," I decided on the classic pyramid scheme, in which a person's success depends on their recruiting of additional people, ad infinitum. The inherent problem is easily illustrated in the image below, which proves that a system of this nature is quite literally unsustainable. I designed an ambiguous pen-and-paper "game" to see if I could embroil my colleagues in a similar scheme. I told two random people that the goal was to create a team-network and they needed to each recruit two people, and tell them the exact same thing I told them. They would fill out the small papers I provided and continue until the paper ran out. Each recruit was to return their papers to the person who recruited them, in effect creating a depth-first search, since I would not get any papers back until all of the people below me had submitted them to their higher-ups. I also mentioned that their score would be determined by the number of people they managed to recruit underneath them, so that they should only choose people who they thought were likely to carry out the instructions. The lack of real incentive didn't seem to hinder people's eagerness to participate, but then again, this is ITP. After my own recruiting, I receded into the shadows to watch the chaos unfold. It was hilarious to watch as people starting asking questions about who the higher-ups were. "Who do I give this back to?" "Who do you give it back to?" "The person who gave it to me." "You mean that guy that was standing over here?" It only had taken me five minutes to become an anonymous figure of lore, just like the criminals who I read about while researching the basis of this experiment. I'm sure these same questions were asked during the downfall of Bernie Madoff's investment scandal. The game also evolved on the fly, which is not something I had anticipated. Due to the half-baked nature of the rules I explained, it wasn't clear to the participants what to do if they only had one sheet of paper. I heard at least one person suggest that they should make their own paper in order to keep it going, which was not my original intention, as I wanted to minimize the amount of effort required by each individual participant. However, I did not intervene, as the mark of a good pyramid manager is to stay laissez-faire all the way to the end. Unfortunately, I did not get back any of the papers yet so I cannot say with any certainty what happened. It appears though that there was not enough of an incentive to encourage their timely return. I will update this when all of the papers are returned to me. A couple weeks ago I decided that the original scope of my project was too ambitious. Creating a wireless sensor module that could exist outdoors is a fairly daunting task (and solar-powered? 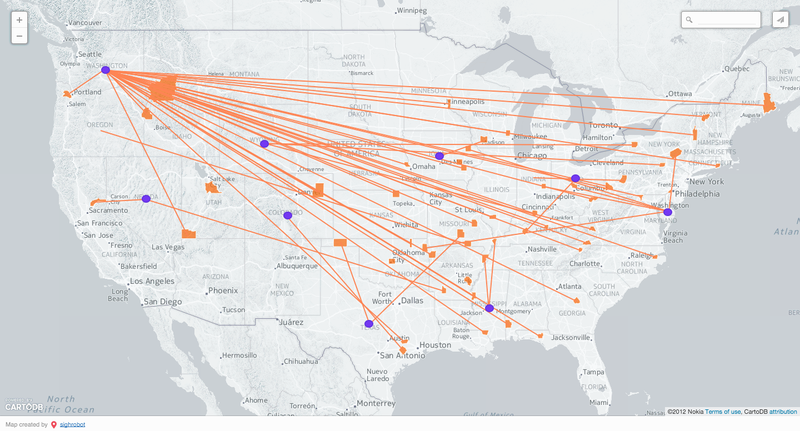 what was I thinking...), and when combined with the front-end map interface it is entirely too much for one semester. However, an indoor version removes a lot of constraints. The modules don't necessarily have to be wireless, power is readily available, there are plenty of mounting options, and the physical area covered by the sensor array is much smaller. Therefore, Sonome ITP is the new name of the project. I still want Sonome to exist as it's own concept so that's why ITP is secondary in the name (small distinction but I think it's worth mentioning as I think about the future of what an urban Sonome would look like). I may experiment with a Google Maps overlay but this depends on if and when they install the indoor map which I submitted to them two weeks ago. The idea would be to place the Sonome visualization on top of an integrated Google Maps floor plan so that mobile users could see their current location within the space. Unfortunately as I said before this feature may not come to fruition, and so my focus for now is on this simplified image version of the ITP floor. The sensor is coming along, too. I think now that "module" is a bit too strong of a word, since what may happen is that several microphones will be connected to one transmitter instead of one microphone per transmitter. Wireless is now optional since I have the space and infrastructure to run wires, but Despina brought up a valid point that a wireless solution may still be the smartest choice, based on the description of the microphone wiring so far. I bought a MEMS microphone breakout and it works really well. It is incredibly sensitive so I have been trying to come up with various ways of normalizing the values coming off of it. I have also successfully connected an Arduino to a Node.js server (via USB) using duino and am able to see the microphone live on the noise map, as well as access the map on other devices on the same network. Being able to use only two colors on a map might at first seems like a limitation. 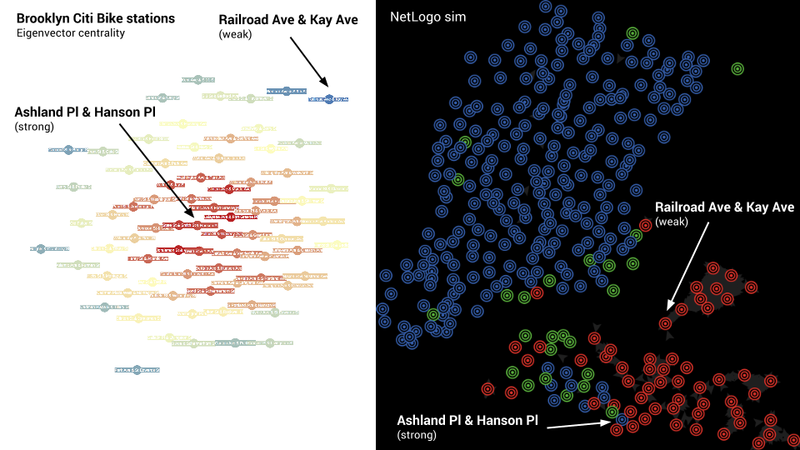 But it makes things much less cluttered and easier to understand, if you choose the right data to visualize. This is a map of every building in Manhattan. 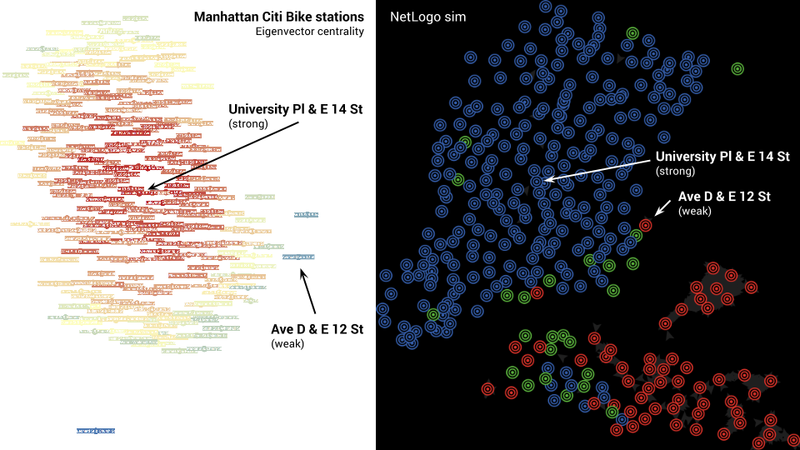 Each blue bubble is a building, and the size of the bubble is determined by how many floors that building has. The background of the map is white, and the building bubbles are blue. 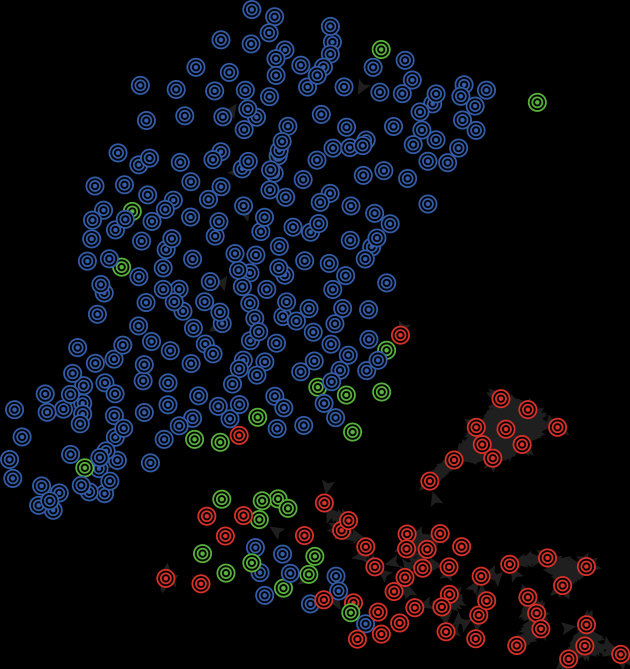 The attribute that gives a meaning to the map layout is the bubble size. Notice how easy it is to pick out the areas where skyscrapers exist. Better yet, zoom in a bit and the city begins to deconstruct. 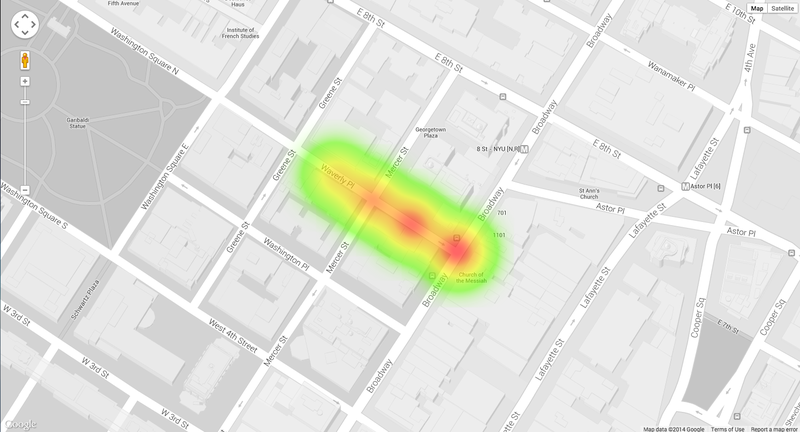 The space between buildings increases and you can see the relative footprints of a high-rise or a walk-up. I had been interested in the number of Americans who joined/tried to join ISIS after reading a couple articles about them. When we read about historical rebel groups, we tend to ignore the fact that that kind of thing can happen in our present day. At least I do. This was an attempt to humanize some of these people. Using Odyssey.js I constructed a simple list of people and the places of their origin, along with short blurbs taken from the original article (dutifully cited in the first slide). It shows that potential jihadists can be found all over the country, and some are even that guy who "was a goofball in high school." 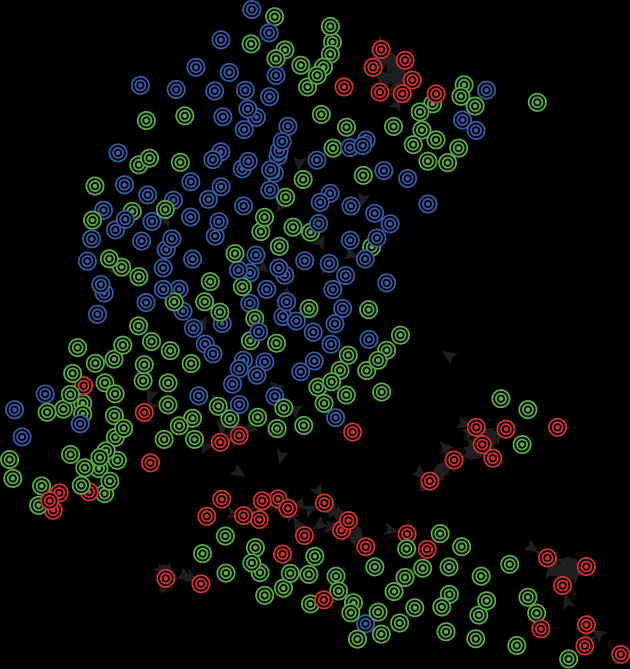 This week I made a proof of concept that would allow me to demonstrate what a live noise map might look like. Originally I was going to use real audio from multiple locations but I ended up using one audio file and just simulated the drop-off of noise levels at each successive node. The map uses a hard-coded array of 44,100 decibel level samples (from a 44.1k audio file). The visualization steps through the values at a rate of 5 per second to simulate the rate that I had wanted to achieve with the actual system. The color scheme is based on sound level intensity (green is low, red is high) and has a radius large enough to just overlap, creating a heatmap-style visualization. You can see the high-intensity noise travel through the nodes, and the heatmap smoothes the movement so the nodes don't display as discrete points. I wanted to make an interesting map of all U.S. counties that are named after U.S. states. I was able to display the shapes of such counties but was unable to do anything further - following the slides verbatim I couldn't get ST_MakeLine to work (after substituting my own table names). Here's the initial map I created using the following SQL. From here I was hoping to draw lines connecting the center of each shown county to the center of each state, respectively. There are a ton of counties named Washington and I wanted to show the intensities of the various namesakes. Again, I couldn't make the map, but here's a mockup of what could've been.